The name of our choir is Latin for Lovers of Song, and that’s exactly what we are. We are committed to song, to making music together, no matter what disharmonies may lie in our way. The works we perform and our venues reflect the diversity of our home city of Berlin. Through dialogue and debate, and through a commitment to the highest standards, we create a musical art that has become a voice for Berlin. 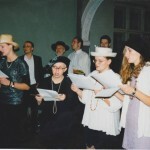 studiosi cantandi Berlin was founded as a student choir in 1991. Nowadays, we have around 140 active members from a diverse range of professions, disciplines and nationalities. But one thing we share above all is the joy of singing, and we want others to join us in discovering its pleasures. With an average age of 37, the choir has a refreshing openness to new musical ideas and works, and new members are always welcome. That is why we keep our membership fee low, to encourage everyone – and especially younger people who may have limited budgets – to join studiosi cantandi Berlin. That way, we maintain our adventurous approach and our high musical standards. Rehearsals take place every Monday from 19:00 to 21:30 in the auditorium of the John Lennon-Gymnasium, Berlin-Mitte. They are led by musical directors Norbert Ochmann and Sergi Gili Solé. Professional voice coach Angela Postweiler also trains our voices individually for the sometimes demanding roles they are required to perform. Additional voice-group rehearsals are held on Thursdays. As the public performance approaches, choir, orchestra and soloists come together as often as three or four times a week to perfect particular passages. Several times a year, we hold intensive rehearsal weekends. 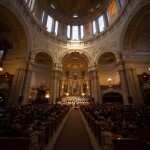 The choir performs two or three concerts a year, each time winning enthusiastic audiences and reviews. Our focus is choral-symphonic music of the last 500 years, from Orazio Vecchi’s comedy madrigals of the 16th century to Christian Paczkowski’s Missa brevis, which we will première at the Philharmonie Berlin in December 2016. In 2008, studiosi cantandi Berlin joined Clemens Goldberg, the musicologist and presenter on Rundfunk Berlin Brandenburg (rbb), to present a chamber concert series called Congratulations at the Konzerthaus Berlin. We then embarked on an exploration of the great choral works with a performance of Verdi’s Requiem. In recent years, the choir has performed famous and less well known requiems by Verdi, Mozart, Schnittke and Britten, but as a complete rhythmic contrast, we also joined the Coco Nelegatti Ensemble to present evenings of Latin music. In 2014, the Berliner Zeitung gave a whole page to its review of the choir’s performance of JS Bach’s Christmas Oratorio. studiosi cantandi Berlin often stages its productions, using lighting, scenery and costumes to offer a more immersive experience. Thus in 2011, light created as much drama as the music in Lux Aeterna, which included works by Schnittke, Mozart and Hartmann. Pink Christmas, with works by Ramirez and Ray, had members of the choir performing in costume. A year later, the choir divided itself into three smaller choirs for a performance of Benjamin Britten’s War Requiem at Berlin Cathedral and into six performing groups for works by Britten and Barber at our Christmas carol concerts. For Walpurgisnacht – A Faustian Dream in 2013, scenery transformed Emmaus Church for three nights. 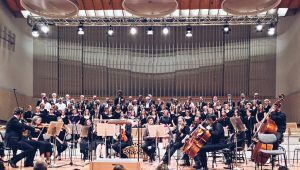 With Karl Jenkins‘ The Armed Man – A Mass for Peace, we took on the theme of religious and cultural co-existence, and were joined by the Muslim communities of Friedenau and Spandau, who supplemented the mass with musical settings of verses from the Koran. Trips abroad and exchange projects with other choirs play an important part in our programmes. In 2003-2004, studiosi cantandi Berlin co-operated with Cor Ariadna of Barcelona, while in 2007, we performed with the Chamber Choir Fenix in Amsterdam and Berlin. One of our most successful collaborations was with the Saint Michael’s Singers of Coventry in the UK. They joined us for a performance of Britten’s War Requiem in Berlin Cathedral in the presence of the Deputy British Ambassador, Sir Andrew Noble. A year later, we jointly presented a concert called Te Deum and English choral works of the late Romantic era, first in Coventry Cathedral as part of the annual Remembrance Day commemoration in 2013, and a few days later in Berlin Cathedral. 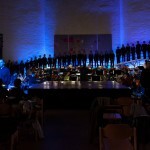 In January 2015, the Jewish Museum Berlin invited us to perform part four of JS Bach’s Christmas Oratorio, which includes the circumcision of Christ, as part of an exhibition called Skin Off! In 2017, we will be performing Carl Orff’s Carmina Burana with the Münchenklang ensemble in Berlin and Munich.